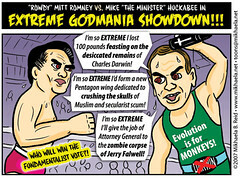 Boiling Point Blog: Feminist, LGBT and progressive political cartoons: New Toon: Mitt vs. Mike in Extreme Godmania Smackdown! New Toon: Mitt vs. Mike in Extreme Godmania Smackdown! Mitt vs. Mike in Extreme Godmania Smackdown! It's "Rowdy" Mitt Romney vs. Mike "The Minister" Huckabee! This is a cartoon from December I hadn't gotten around to posting. Are you as scared of these dudes as I am?